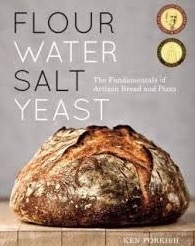 Flour Water Salt Yeast is a partially a memoir about how former Silicon Valley technology worker and author Ken Forkish fell in love with artisan bread making, partially a technical manual about making the best bread possible, and partially, a charming easy to follow cook book. The book itself is beautifully produced, whether you’re looking at the original hardcover or the digital version; in my case reading it on my iPad made realize I wanted a print copy. I’m not alone in my admiration for the design and the contents; Flour Water Salt Yeast won the 2013 James Beard Foundation Book Awards for a cookbook in the baking and dessert category (Forkish, by virtue of his Artisan Bakery in Portland, Oregon was also a finalist for the Pastry Chef award). There’s a welcome index as well as a detailed table of contents. After an idiosyncratic essay in his opening chapter about how he came to want to be an artisan bread baker, Forkish offers a choices of paths through his book; you can skip to the detailed method and recipe chapters, or you can read about the how and why of artisan bread production from flour and salt through yeast and the production of levain. Forkish emphasizes the necessity for not only quality ingredients, but proper tools and the necessity of adequate time for the yeast to perform and ferment properly. His second section, Basic Bread Recipes, is just as much about process, including how to scale recipes up or down, and the necessity of accurate measurement of ingredients and temperature. This is the aspect that may turn off some readers; Forkish really is being very specific both about the ingredients and the process, but he carefully explains each step and uses photographs to supplement his instructions. His explanations are very clear, and following them carefully does pay off, but you really do need to stay the course carefully. He follows his detailed explanation of the process (from measuring to baking) with recipes for both white and whole wheat breads, and versions for overnight rising and shorter rising times. Part 3 is all about levain, including making your own, and basic methods for producing doughs with your own levain. Forkish is very aware that his primary audience is going to be home cooks, so he carefully explains practical methods for maintaining the health of your levain when you are likely only baking bread once a week. His ninth chapter is a series of carefully explained and delicious hybrid leavening dough recipes using levain and commercial yeast; these include a variety of kinds of flour, a traditional pain de campagne, and even a walnut bread. Chapter ten covers pure levain based bread making, with step by step instructions for over-night rising white and dark breads and even a pain au bacon. His final chapter in the section covers more advanced levain breads, and how to create your own bread or pizza dough recipes. Part 4 is about using Forkish’s methods to make pizza dough, focaccacia and numerous recipe variations. He even covers using a pizza stone for the perfect crust in a home oven. Again, after a thorough discussion of technique, he follows with detailed step-by-step instructions for several doughs, ranging from a basic overnight dough using commercial yeast, one using levain, then recipes for a large variety of pizza and focaccia. His pizza recipes are amazing and include skillet-baked pizzas. Forkish is well-respected as a baker, but his instructions in Flour Water Salt Yeast and the clarity of his steps are an exemplary example of not only culinary writing but of technical writing. I think it’s telling that he not only provides detailed recipes for breads he produces at his bakery, but that he also tested his recipes in his own home kitchen. Most notably, Ken Forkish manages to explain the why of things without losing track of his reader. He manages to communicate his fierce, passionate love of artisan bread. His detailed, technical approach to bread making may frustrate some readers, but I learned an enormous amount from reading this gorgeous book.